With the sophistication of hiring tools, there has also been a rise in more sophisticated interviewees. Today, interviewees have a wealth of information at their fingertips regarding your job interviewing process and how to answer questions to improve their likelihood of being hired. If you were to base your decision solely on their interview responses, then you could easily be conned into making a bad hire. That’s where reference checking services come into play. For example, with Checkster’s digital reference check solution, you can automatically check a candidate’s references, verify for fraudulent usage (some references try to game the system), and gather more detailed, candid feedback from more references about your candidates, all while never having to pick up the phone. The tool gives you a more complete picture of the candidate, uncovering inconsistencies or disparities that traditional ask / answer reference check questions won’t reveal. One way Checkster is able to elicit effective and forthright feedback in our reference checks is by using tested, specific survey questions (validated by independent I/O psychologists) that are proven to be accurate predictors of performance and turnover. Although these surveys are only available inside the Checkster tool, we’ve gathered together a basic list of sample reference check questions to help you get started in extracting better information from your reference checks. Below you’ll find some of the best samples of reference check questions for employers that you can use for a candidate’s managers, peers, subordinates, and personal references. What is your relationship with the candidate? Can you verify the candidate’s employment and job title? Can you describe the candidate's job responsibilities? Did the candidate miss a lot of work? Was he/she frequently late? Did he/she get along with management and co-workers? Would you describe the candidate as being more a team player? or did they prefer to work independently? How did the candidate support/collaborate with co-workers? Was the candidate ever promoted within the company? Did the candidate ever supervise other employees? How effectively? What makes the candidate a good fit for our current role of [insert role]? What are the candidate's biggest strengths and areas for improvement? What is it like to work with the candidate? What advice can you provide to work with the candidate successfully? What else should I know about the candidate that I didn’t ask? How did the candidate handle stress/conflict/pressure? Was the candidate ever promoted during his time at the company? Would you recommend the candidate? How would you describe the candidates listening and communication skills? Why did the candidate leave the job? What was the candidate’s most significant accomplishment while working for your company? Did you evaluate the candidate’s performance? What did you note as needing improvement during performance reviews? What type of environment do you think the candidate would thrive in (describe culture, team, management, autonomy)? How would you describe the candidate’s management style? Did he /she effectively communicate your responsibilities? How would you describe the candidate’s communication/listening skills? Would you work for the candidate again? What qualities about the candidate make him/her a great leader? Are there any qualities that don't? Have you ever worked with the candidate on a professional capacity? What are some of his/her traits that you believe will make them a strong hire? In your experience with the candidate, how does he/she handle stress? Conflict? Pressure? Would you trust the candidate with large sums of money, children, or sensitive information? Why or why not? How does the candidate interact with others? If you were the hiring manager, would you hire the candidate? Checkster’s digital reference checks make it easy to collect reference feedback quickly, with minimal effort for you, your recruiters, your candidates, and your references. By going digital, starting the reference check process is easy. Choose from a set of templatized questions (and customize as you see fit), and invite the candidate to log into Checkster. Instead of spending hours calling references, through 2 minutes of set up, you empower candidates to invite their references quickly. References then give feedback to your questions anonymously online from any device, and their answers are automatically collected into actionable reports to improve the overall value of reference feedback. If a reference doesn’t respond, the candidate can send reminders with just the click of a button. 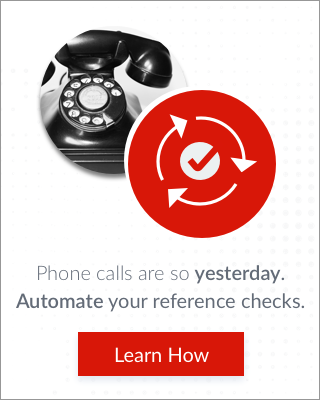 Because the process is easy on references, recruiters receive back 6+ references on average using Checkster, a big jump up from the two responses they get from making reference check phone calls. Clients boast a time savings of over an hour per candidate while enjoying richer, more candid feedback from more references overall. For more information, please read the information on Checkster’s Reference Checking, or sign up here for a demo of Checkster.